West Nile virus is transmitted by mosquito's and causes an illness that ranges from mild to severe. Mild, flu-like illness is often called West Nile fever. More severe forms of disease, which can be life-threatening, may be called West Nile encephalitis or West Nile meningitis, depending on where it spreads. West Nile virus is a type of organism called a flavivirus and is similar to many other mosquito-borne viruses, including Japanese encephalitis (which is found in Asia). Researchers believe the virus is spread when a mosquito bites an infected bird and then bites a person. West Nile virus was first identified in 1937 in the West Nile region of Uganda, in eastern Africa. It was first identified in the US in the summer of 1999 in the Queens borough of New York, NY. It caused 62 cases of encephalitis and 7 deaths that summer. Since 1999 the virus has spread throughout the continental US and as of July 2004 has been identified in 46 states. Mosquito's carry the highest amounts of virus in the early fall, thus there is a peak of disease in late August-early September. The risk of disease then decreases as the weather becomes colder and mosquito's die off. Although many people are bitten by mosquito's that carry West Nile virus, most do not know they've been exposed. Few people develop severe disease or even notice any symptoms at all. Data from the outbreak in Queens suggests that although 2.6% of the population was infected, only 1 in 5 infected people developed mild illness, and only 1 in 150 infected people developed brain inflammation (meningitis or encephalitis). West Nile virus may also be spread through blood transfusions and organ transplantation. It is possible for an infected mother to transmit the virus to her child via breast milk. These symptoms usually last for 3 to 6 days. Signs of West Nile virus infection are similar to those of other viral infections. There is nothing that can be found on physical examination to diagnose West Nile virus infection. A rash is present in 20-50% of patients. True muscle weakness in the presence of other related symptoms is suggestive of West Nile virus infection. The most accurate way to diagnose this infection is serology, a test to detect the presence of antibodies against West Nile virus in CSF or serum (a blood component). This is considered the gold standard for diagnosis. Rarely, a sample of blood or CSF may be sent to a lab to be cultured to evaluate the presence of West Nile virus. The virus can also be identified in body fluids using a technique called polymerase chain reaction (PCR). However, these methods can provide false negative results. Because this illness is not caused by bacteria, antibiotics do not help treat West Nile virus infection. Standard hospital care may help decrease the risk of complications in severe illness. 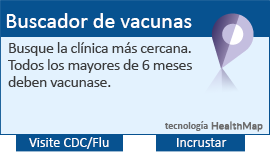 There is no human vaccine available at present, and it is likely there will not be one for several years. In general, the likely outcome of a mild West Nile virus infection is excellent. For patients with severe cases of West Nile virus infection, the outlook is more guarded. West Nile encephalitis or meningitis has the potential to lead to brain damage and death. Approximately 10% of patients with brain inflammation do not survive. Complications from mild West Nile virus infection are extremely rare. Complications from severe West Nile virus infection include permanent brain damage or muscle weakness (sometimes similar to polio), and death. 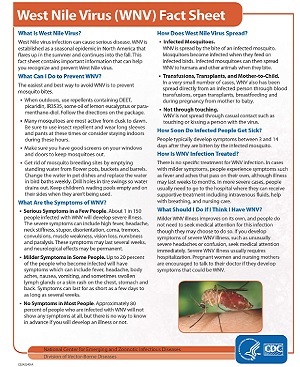 Call your health care provider if you have any of the symptoms of West Nile virus infection, particularly if you may have had contact with mosquitoes. If you are severely ill, seek attention in an emergency room. If you have been bitten by an infected mosquito, there is no treatment to avoid development of West Nile virus infection. People in good general health generally do not develop a serious illness even if bitten by an infected mosquito. DEET – Apply insect repellent containing DEET, picaradin, oil of lemon eucalyptus or IR 3535 according to label instructions. Apply repellent only to exposed skin and/or clothing. DEET can be used safely on infants and children two months of age and older (http://www.cdc.gov/ncidod/dvbid/westnile/repellentupdates.htm). DAWN AND DUSK – Mosquitoes that carry WNV tend to bite in the early morning and evening hours, so it is important to wear repellent when outdoors. Make sure that your doors and windows have tight-fitting screens to keep out mosquitoes. Repair or replace screens with tears or holes. DRESS – Wear clothing that reduces the risk of skin exposure (i.e., long pants and long-sleeved shirts). Residents are encouraged to report dead birds online at the California West Nile virus website or by calling toll-free 877-WNV-BIRD (877-968-2473).